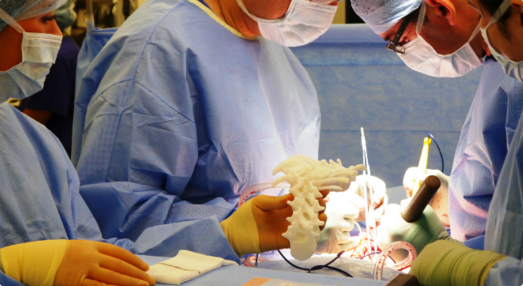 In a UK-first, surgeons at Alder Hey Children’s Hospital successfully used a 3D printed model of a spine to help complete an operation. The procedure was the first time NHS doctors have ever used a 3D printed model in the operating room. The model was used by surgeons on the West Derby hospital’s orthopedic team in their efforts to correct the curved back of an eight-year-old patient. The young girl from Whales suffers from kyphoscoliosis, a complicated congenital spinal problem. The plastic model was made with the help of the patient’s CT scans, which were converted into a 3D printable format. The life-size replica was printed in a plastic so it could be sterilized, and then used in the operating room as a guide for the surgeons performing the operation. This case is also the first time that a 3D printed model has been taken into the operating room to be used as a reference tool by NHS doctors. Jai Trivedi, Neil Davidson and Colin Bruce were the surgeons who performed the operation. 3D LifePrints has been working closely with a number of Alder Hey doctors in orthopedics, cardio, craniofacial surgery, radiology and other areas to develop 3D models. Both parties believe the models can assist doctors with complex operations, enable easier communication between doctors and patients, and facilitate learning. The successful surgery comes after a new scientific research center was recently opened next to Alder Hey, one component of £260m invested in future development. The center boasts an innovation hub where doctors and scientists can work on building new healthcare technology, as well as facilities for developing and testing new medicines. The innovation service has the goal of harnessing less widely used technologies in healthcare (including 3D printing and bio-sensors) to develop strategies that improve health outcomes for surgery and critical care treatment. This eight-year-old’s successful surgery is just another one of the many examples of how 3D printing can make medical treatment safer and more effective.